When my kids first introduced me to the Box Lunch stores, I immediately fell in love with the retailers wide variety of television merchandise. I mean, how can you not feel all nostalgic when you see FRIENDS, Gilmore Girls, Seinfeld, and Buffy the Vampire Slayer t-shirts with the shows famous taglines? 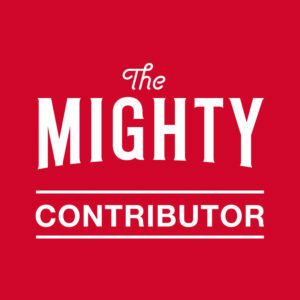 What really got me on board with this pop culture themed retailer was the fact they give back to others. Through a partnership with Feeding America, for every $10 you spend at Box Lunch, they will help provide a meal to a person in need. Not only should you consider making Box Lunch your one-stop place for gifts to give to your next family members, friends, co-workers, even your pets; if you ever get the chance to attend one of their grand openings, you’ll be in for some fun prizes. Ask my teenager who woke me up at 5 A.M. to attend the Fox River Mall Box Lunch’s Grand Opening on his birthday. He wanted to try his luck at nabbing one of the gift cards valued anywhere from $10-$100. Not only did we get there 2 hours before the grand opening, we were the very first two people in line. Was it worth it to be one of the first 50 people in line? We each received a gift card valued at $10 to use in the store. Of course, I gave mine to the birthday boy who bought a few of his favorite Funko Pops for his massive collection. On top of all of that, Box Lunch handed out coupons to use towards online or in store purchases and reusable cloth bags. 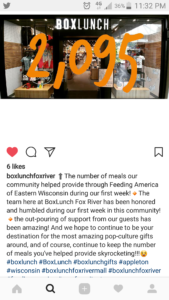 A week later, the Appleton store I attended the Grand Opening for, posted on Instagram how they successfully helped fed local residents in need with the help of their shoppers. Even if you don’t have a Box Lunch store near you, you’re able to go to their website and purchase similar items online. Remember, for every $10 you spend, you help provide a meal to those in need.